I have a service process that I would like illustrated into a user friendly graphic that shows the flow of the process in stages. I can provide a basic mockup of what I'm looking for and how it should look. Overall, it's a pretty simple process and the illustration will depict representations of people, information, and how the service works. Edit: About the service process uploaded image. A single user is seeking information about a legal case citation (Ashcroft v. Iqbal) and the issues are listed below the case. When the user searches for the information on his own, the results are usually an overwhelming amount of information, unorganized, and difficult to sort through- especially as an individual. But the service being offered is to crowdsource the search process among many users. The many users can then sort through all the difficult information and collectively provide clean, useful, organized results. That's more or less what the image is trying to relate, and that's the service process I would like depicted. 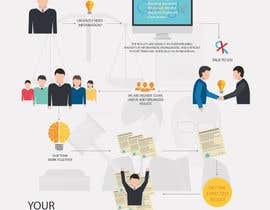 Do u want to have an infograph??? Please elaborate on your service process. Can you provide me details about your process & concept? hello , i am interested in your projects, can you give me more details ? so what do you need sir. Name? or Logo or Slogan?. Be specific.